Autumn leaves in the breeze adds a flowing dimension to your wall. The dark brown, melon and orange colours reflect Autumn at its best. This kit allows you to follow the idea listed below or let your imagination flow with your own design. Want more privacy but don’t want net curtains? Why not have opal frost window film, cut with a decorative design or printed? They offer privacy but allow you to see out a little. Even if the lights are on you still are not on full view. If you have bay windows the design can flow round the windows. We have many styles and can offer different colour options for some, just submit your sizes by email stating the design you require and we can email a quote back for the kit to fit your windows. Mosaic design can be in most colour options just ask. Banksy's girl with a balloon can be printed or cut out depending on how much of outside the window you want to see. Likes us on Facebook or follow us on Twitter for updates and exclusive special offers and discount codes. Browse our beautiful collection of unique vinyl wall art graphics. Each piece has been exclusively designed by All Sign Solutions and can be customised to your personal specifications. 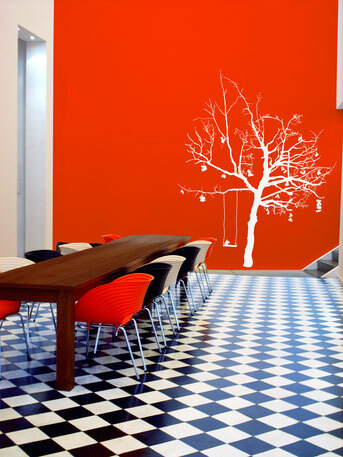 These wall art stickers are made from a range of coloured matt vinyl each designed to enhance the décor of your rooms. From bedroom to living rooms, from bathrooms to offices there is something to suit everyone. The themes include sea inspired designs, with ocean creatures, boats, light houses and text. The vintage section is a collection of quirky knick-knacks, clocks and other household items with a vintage feel. Love nature and want to bring the outside inside? Then browse our trees, birds, fungi, big cats and butterflies. Want to make a statement? Check out the faces and especially the giant eyes. We also offer bedroom styled wall art, various shapes, and even Halloween themed designs. We've selected some colour choices for each of the printed graphics but if you would like another colour please just ask. We have selection of contemporary, amusing and classic images from which you can choose. Again these have various options available but if you would like something different please just ask. Each vinyl design is supplied in kit form, with very easy to follow pictured instructions to make fitting simple and worry free.